2 2 PHD Business Administration-Finance ECON 721 Mathematical Economics 3 ECON 725 Econometrics 1 3 ECON 726 Econometrics 2 3 ECON 727 Econometrics 3 3 ECON 735 Portfolio Theory 3 ECON 736 Asset Pricing 3 FIN 737 Corporate Finance Theory 3 FIN 741 Corporate Finance Seminar 3 FIN 742 Investments Seminar 3 FIN 743 Advanced Topics Seminar 3 Electives (requires approval of Finance Program Coordinator 6 Total Hours 43 Students who have an M.S. in finance or an MBA with concentration in finance from an accredited academic institutionn can enter into the Ph.D. program directly. Alternatively, if students lack sufficient academic background in finance, our M.S. in finance program will serve as an essential preliminary step towards a Ph.D. degree. PRE-PH.D. YEAR: M.S. 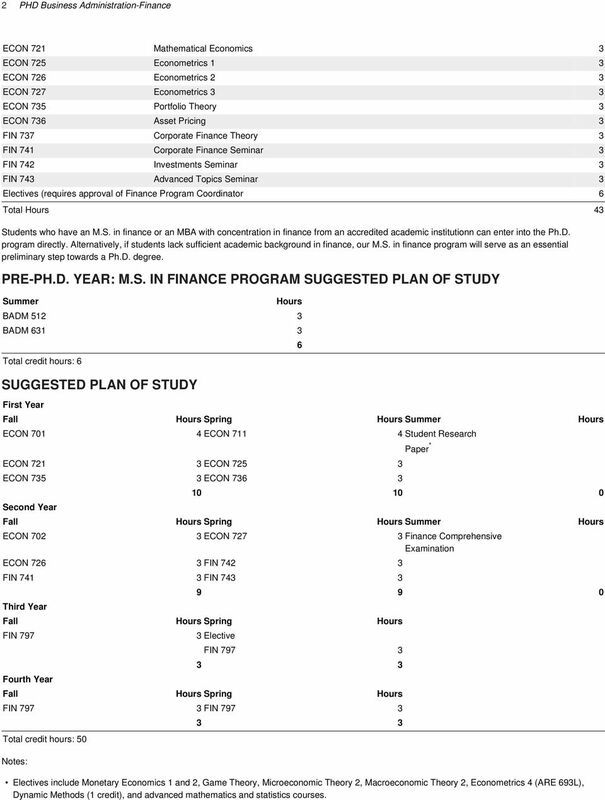 IN FINANCE PROGRAM SUGGESTED PLAN OF STUDY Summer Hours BADM BADM Total credit hours: 6 SUGGESTED PLAN OF STUDY First Year 6 Fall Hours Spring Hours Summer Hours ECON ECON Student Research ECON ECON ECON ECON Second Year Paper * Fall Hours Spring Hours Summer Hours ECON ECON Finance Comprehensive Examination ECON FIN FIN FIN Third Year Fall Hours Spring Hours FIN 797 Fourth Year 3 Elective FIN Fall Hours Spring Hours FIN FIN Total credit hours: 50 Notes: 3 3 Electives include Monetary Economics 1 and 2, Game Theory, Microeconomic Theory 2, Macroeconomic Theory 2, Econometrics 4 (ARE 693L), Dynamic Methods (1 credit), and advanced mathematics and statistics courses. 3 West Virginia University 3 First year research paper: a completed paper must be presented to faculty and doctoral students by the end of the first summer. The paper should be original work with a clear potential for publication. Second year research paper: a completed paper must be presented to faculty and doctoral students early in the fall semester of the third year. The paper must be of sufficient quality to be submitted to a good academic journal. The paper will be evaluated by faculty as part of the finance comprehensive exam. COURSES FIN 500. Corporate Finance. 3 Hours. PR: BADM 511, BADM 522, and BADM 524. A practical consideration of the operation of financial markets, considerations for the inter-temporal comparisons of opportunities, and the elements of the decision-making criteria for the financial manager. FIN 510. Investments & Portfolio Mang. 3 Hours. PR: FIN 500. The course provides theoretical understanding of how financial decisions are made under uncertainly. The topics include the securities market environment, modern portfolio theory, risk analysis, bond and stock valuations, and derivative securities. FIN 511. Financial Economics. 3 Hours. A survey of Microeconomic Markets in the U.S. economy. Examines how the U.S. System interacts with larger global economy. FIN 512. Ethical Standards in Finance. 3 Hours. An overview of the impact of legal, societal, and ethical considerations on business decision-making and strategic planning in the finance industry. FIN 513. Macroeconomics/Financial Mrkts. 3 Hours. This course provides students with an understanding of how macroeconomic performance is measured, how monetary and fiscal policies influence macroeconomic performance, and how these relate to financial markets around the world. FIN 520. Quantitative Finance. 3 Hours. Examines statistical and probability concepts, statistical inference, regression analysis, time series analysis and financial modeling. Emphasizes financial applications, including portfolio optimization and analysis of financial time series. FIN 521. Financial Reporting/Analysis. 3 Hours. Fundamental security analysis requires that cash flows be evaluated primarily using external accounting data. This course provides students with the skills necessary to evaluate financial reports focusing on firm valuation. FIN 522. Adv Corporate Finance. 3 Hours. Case study approach focusing on complex problems in the corporate forecasting, capital budgeting, cost of capital analysis, the financing of capital investments, and financial decisions on strategic investment. FIN 523. Equity Investment. 3 Hours. This course provides students with professional knowledge of investment tools in equity markets, industry and company analysis, valuation models, and equity portfolio management. FIN 525. Derivative Securities. 3 Hours. PR: FIN 510. This course will extend the student s knowledge of derivatives markets for commodities and financial instruments. Particular attention will be given to the use of financial derivatives for risk management. FIN 526. Portfolio Management. 3 Hours. Examines the complete investment process from constructing investment objectives and policies to strategic asset allocation, security selection, trade execution, portfolio monitoring, and performance measurements. FIN 527. Alternative Investments. 3 Hours. Alternative investments are a growing presence in financial markets. These investments allow the investors to diversify their portfolios beyond rational debt and equity securities. This course provides students with the skills necessary to understand the risks and rewards in alternative investment markets. FIN 528. Integrated Financial Analysis. 3 Hours. This is a capstone course that brings together all elements of financial planning including ethical standards, quantitative methods, economics, financial reporting, corporate finance, equity and fixed income investments, derivatives, portfolio management, and wealth planning. FIN 530. Energy Financial Economics. 3 Hours. Introduction to the ways in which legal/regulatory systems affect the energy industry and to important economic and political concerns that underlie the regulation of the producation and trading of energy and the connections to the derivative markets for the energy sector. FIN 531. Energy Law/Regulation/Ethics. 3 Hours. Provides an understanding of energy markets and the ancillary markets, the legal and regulatory environments, and the ehtical questions surrounding this business sector. Additionally, the course will help prepare participants to address the ethical standards of the finance profession. FIN 532. Energy Financial Accounting. 3 Hours. Provides the tools to interpret and analyze external financial information from the viewpoint of investors and creditors. The energy sector has a unique perspective from other industries. The role of mark to market accounting techniques will be emphasized. 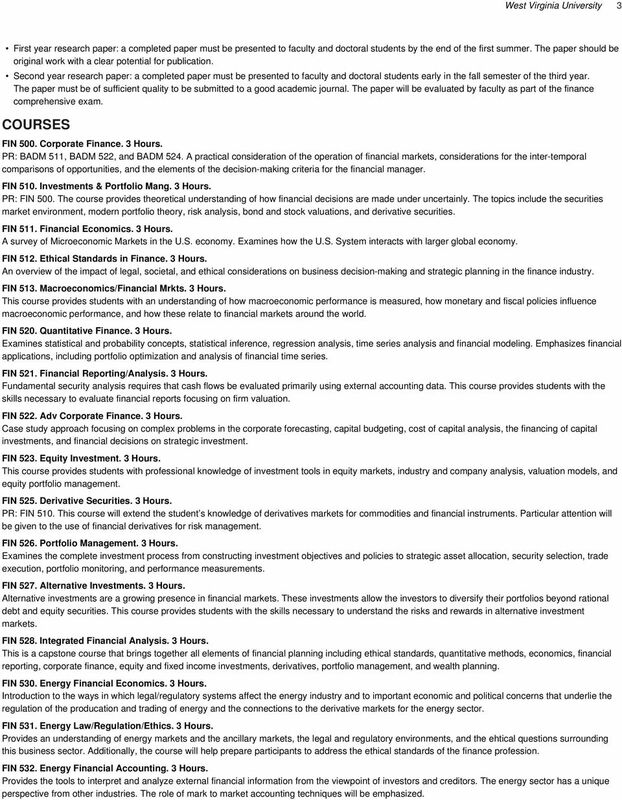 4 4 PHD Business Administration-Finance FIN 533. Energy Financial Risk Managmnt. 3 Hours. Investigates the evolving and expanding practice of financial risk management in the energy sector. Risk management is a complex process of identifying, quantifying, and managing risk exposures. The course analyzes and dicusses the various sources of risk. FIN 591A-Z. Advanced Topics. 1-6 Hours. PR: Consent. Investigation of advanced topics not covered in regularly scheduled courses. FIN 592A-Z. Directed Study. 1-6 Hours. Directed study, reading, and/or research. FIN 593A-Z. Special Topics. 1-6 Hours. A study of contemporary topics selected from recent developments in the field. FIN 594A-Z. Seminar. 1-6 Hours. Special seminars arranged for advanced graduate students. FIN 595. Independent Study. 1-6 Hours. Faculty supervised study of topics not available through regular course offerings. FIN 690. Teaching Practicum. 1-3 Hours. PR: Consent. Supervised practice in college teaching of finance. Note: This course is intended to insure that graduate assistants are adequately prepared and supervised when they are given college teaching responsibility. It also provides a mechanism for students not on assistantships to gain teaching experience. (Grading will be P/F.). FIN 691A-Z. Advanced Topics. 1-6 Hours. PR: Consent. Investigation of advanced topics not covered in regularly scheduled courses. FIN 695. Independent Study. 1-6 Hours. 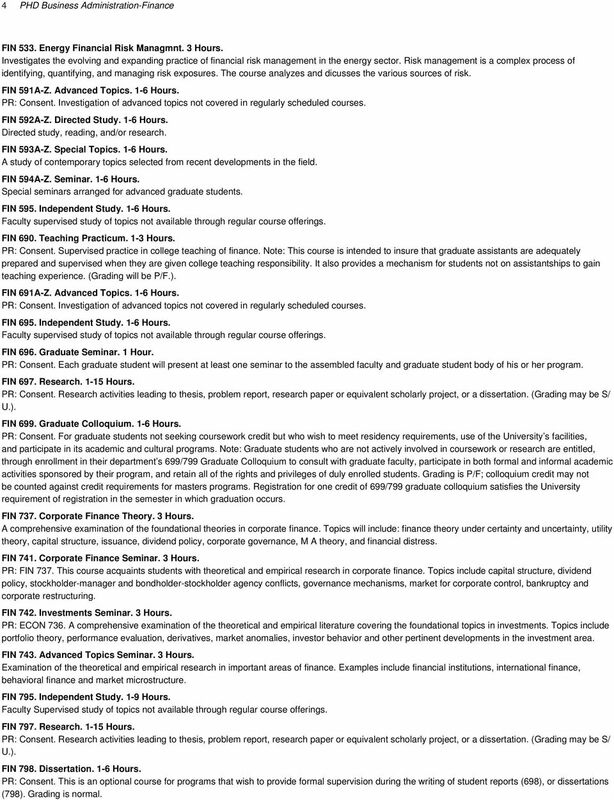 Faculty supervised study of topics not available through regular course offerings. FIN 696. Graduate Seminar. 1 Hour. PR: Consent. Each graduate student will present at least one seminar to the assembled faculty and graduate student body of his or her program. FIN 697. Research Hours. PR: Consent. Research activities leading to thesis, problem report, research paper or equivalent scholarly project, or a dissertation. (Grading may be S/ U.). FIN 699. Graduate Colloquium. 1-6 Hours. PR: Consent. For graduate students not seeking coursework credit but who wish to meet residency requirements, use of the University s facilities, and participate in its academic and cultural programs. Note: Graduate students who are not actively involved in coursework or research are entitled, through enrollment in their department s 699/799 Graduate Colloquium to consult with graduate faculty, participate in both formal and informal academic activities sponsored by their program, and retain all of the rights and privileges of duly enrolled students. Grading is P/F; colloquium credit may not be counted against credit requirements for masters programs. Registration for one credit of 699/799 graduate colloquium satisfies the University requirement of registration in the semester in which graduation occurs. FIN 737. Corporate Finance Theory. 3 Hours. A comprehensive examination of the foundational theories in corporate finance. Topics will include: finance theory under certainty and uncertainty, utility theory, capital structure, issuance, dividend policy, corporate governance, M A theory, and financial distress. FIN 741. Corporate Finance Seminar. 3 Hours. PR: FIN 737. This course acquaints students with theoretical and empirical research in corporate finance. Topics include capital structure, dividend policy, stockholder-manager and bondholder-stockholder agency conflicts, governance mechanisms, market for corporate control, bankruptcy and corporate restructuring. FIN 742. Investments Seminar. 3 Hours. PR: ECON 736. A comprehensive examination of the theoretical and empirical literature covering the foundational topics in investments. Topics include portfolio theory, performance evaluation, derivatives, market anomalies, investor behavior and other pertinent developments in the investment area. FIN 743. Advanced Topics Seminar. 3 Hours. Examination of the theoretical and empirical research in important areas of finance. Examples include financial institutions, international finance, behavioral finance and market microstructure. FIN 795. Independent Study. 1-9 Hours. Faculty Supervised study of topics not available through regular course offerings. FIN 797. Research Hours. PR: Consent. Research activities leading to thesis, problem report, research paper or equivalent scholarly project, or a dissertation. (Grading may be S/ U.). FIN 798. Dissertation. 1-6 Hours. PR: Consent. This is an optional course for programs that wish to provide formal supervision during the writing of student reports (698), or dissertations (798). Grading is normal. 5 West Virginia University 5 FIN 930. Professional Development. 1-6 Hours. Professional development course provide skill renewal or enhancement in a professional field or content area (e.g. education, community health, geology). These tuition-waived continuing education courses are graded on a pass/fail grading scale and do not apply as graduate credit toward a degree program. 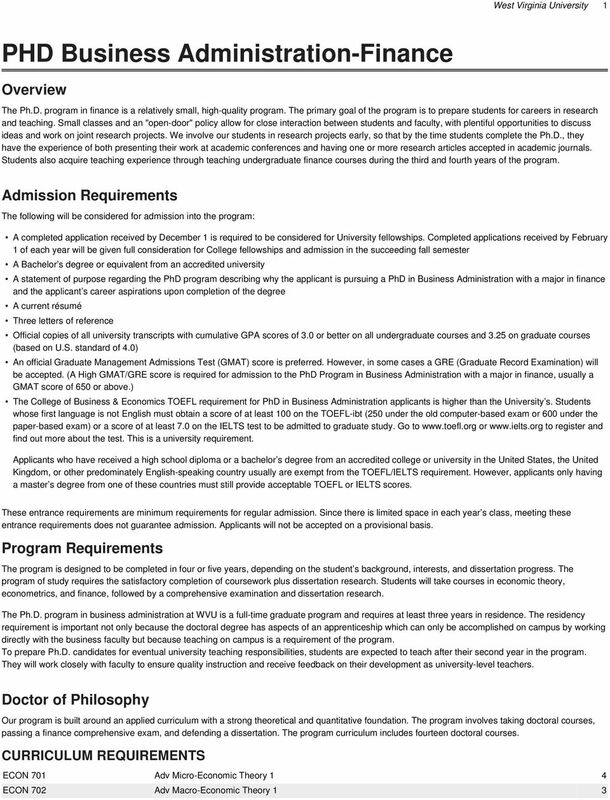 Kellogg School of Management Doctoral Program in Finance The Finance doctoral program provides students with a rigorous background in nance, both theoretical and empirical, economics, mathematics and statistics.